Stock your glovebox to help create a quick-change diaper station on your unfettered front seat. Having survived thousands of miles of road trips with diaper-clad co-pilots, I can tell you one thing with certainty: diaper changing facilities are few and far between along America’s great highways. Rest Areas are generally not equipped, and it never fails to surprise me how even the fast food restaurant with the 2-story play structure and high chairs lining the wall never seems to have a place for changing diapers in the restroom. Stash a few diapers, a travel-pack of diaper wipes and pack of antibacterial hand wipes in your glove box for quick access during front-seat changes. Keep a baby blanket or changing mat handy (flannel-backed vinyl works well) to protect the seat. If you have “bucket seats” or an emergency break in between the front seats of your car, bring along a firm pillow from home to even out the surface beneath your changing mat (also helpful for bottle- or breastfeeding breaks along the way, and napping). Use a firm bed pillow to help even out bucket seats for diaper changes during road trips with your baby. Have a large slide-lock plastic bag on hand to stow away diapers when a waste bin is not immediately available. Use the antibacterial hand wipes to freshen hands afterward. The Huggies blue Hawaiian Diaper on my little guy. And remember, if you pack along these vacation-ready Huggies Hawaiian Diapers and Wipes for your trip, Huggies Every Little Bottom will donate a day’s worth of diapers to families in need for every pack purchased this summer! Read all about it in my post Dressed cute for a cause in Kauai. 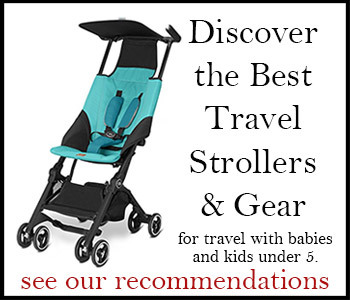 Want more tips for road trips with your baby or toddler this summer? Do not pass go, but head directly to the “Travels by Car” tips page for more quick tips and advice. Find all the planning help you can handle for successful family road trips with young children in Part 4 of Travels with Baby, and in related sections on temperament, packing, and more. As you travel, keep hundreds of on-the-go tips at your finger tips to help in the car, in restaurants, in hotel rooms, in airports, on airplanes, in foreign countries, and more with the pocket-size Take-Along Travels with Baby. How about you? Do you have a great on-the-go diaper changing tip? Please share in comments below! Wow! this is really helpful. I’m just turn to be a father of 1 month old baby and i really don’t have any idea on how to change diapers during road trips. The way you described this procedure- well-organized and easy made me think that my husband and I could make it- our first going to the sea vacation with little Chris.